In the last few weeks I’ve begun to notice a subtle shift in peoples’ attitude towards the summer. 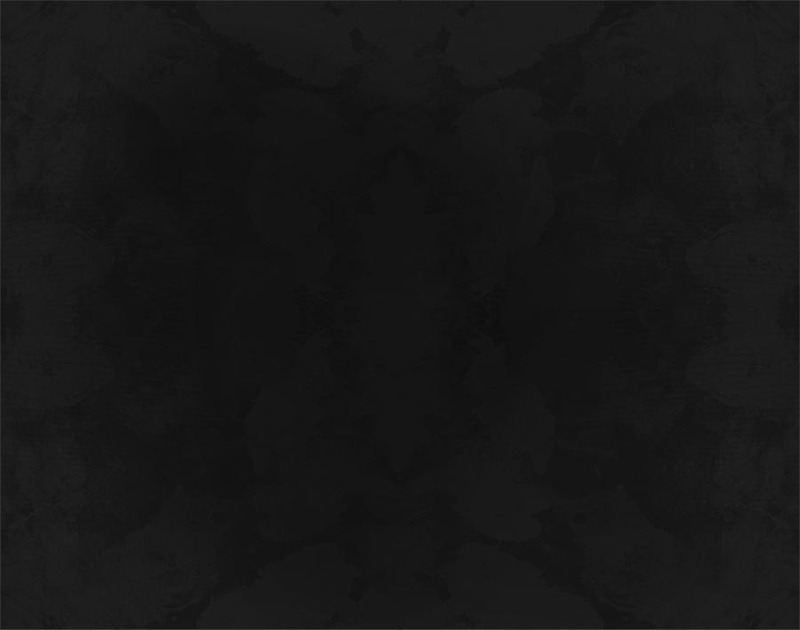 Gone is the air of anticipation that was everywhere in May and June. So, too, is the vibe of communal celebration that marked the month of July, when people across the city seemed to be gathering at outdoor cafes until the wee hours reveling in the long days and warm nights, or racing out of the office early to catch a train for a three- or four-day weekend somewhere. No, that sense of collective excitement has clearly burned away, leaving in its place something a little more, well, resigned—resigned that the season of fun and freedom is quickly winding down, to be replaced by one of renewed commitments, and responsibilities, and scheduling. In fact, just yesterday someone asked me, “How was your summer?” Was my summer?! I quickly reminded him (and myself) that it wasn’t over just yet, that there are still some warm nights and long weekends to be enjoyed. All the same, I can’t deny that I, too, hear that end-of-summer drumbeat. 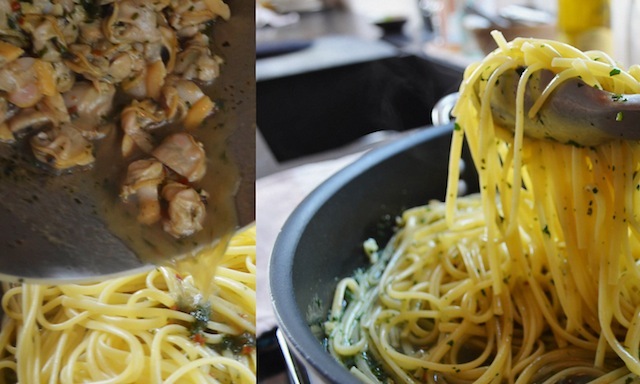 Which in its way makes this week’s posting for linguine and clam sauce all the more timely. After all, there are few things that offer a greater concentration of summer-y flavors than this simple pasta dish. Of course, unlike anything made with sweet corn or heirloom tomatoes, it’s a meal that can be enjoyed more or less year-round, but for me there’s something about the briney, garlicky combo here that makes this especially right when the weather gets warm. Come July, it’s a dish I start to crave. So assuming I haven’t scared you away with all that, let me bring to your attention what in my estimation is a quite wonderful, not to mention easy, version of this classic dish. It’s one I pulled out of a back issue of Fine Cooking, and no doubt it’s the recipe’s traditional, by-the-book quality that drew me to it in the first place, as it reminded me of the dish my dad would invariably order when I was a kid and we’d have one of our occasional family dinners at his favorite red sauce establishment in South Philadelphia. I wasn’t so interested in clam sauce in those days (if memory serves, lasagna and garlic bread were my two fixations back then), but the smell of the garlic and white wine-infused broth seems nonetheless to have made a lasting impression on my brain, since any close approximation of that restaurant’s preparation tends to take me right back to those long ago family meals. 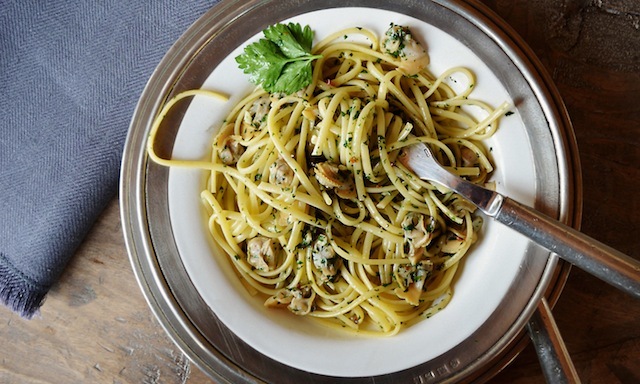 This recipe does just that, while also improving on my earlier experience of the dish in one, key way: the clams are removed from their shells prior to being tossed with the pasta. It’s a change that, for some, may detract from the dish’s overall plate appeal, but that makes for an infinitely, and undeniably, more pleasant eating experience, as well. 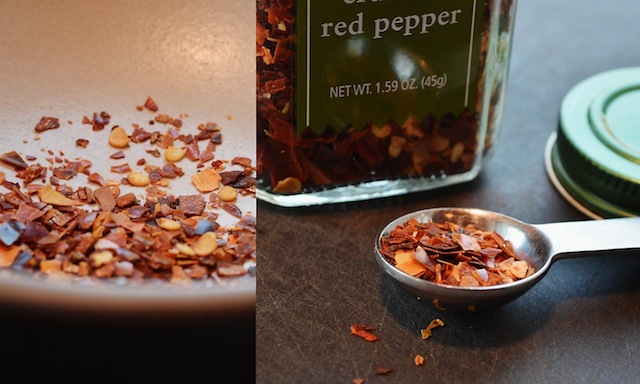 To start, heat half of the olive oil along with the red pepper flakes in a three-quart saucepan for 20 seconds or so—just long enough for the flavor of the flakes to infuse the oil. Next add the wine, two tablespoons of the chopped parsley, and half of the minced garlic, and cook for another 20 seconds, a period during which your kitchen will start to smell about as mouth-wateringly delicious as you can imagine, since there are few fragrances more intoxicating than those of the above ingredients as they’re exposed heat. 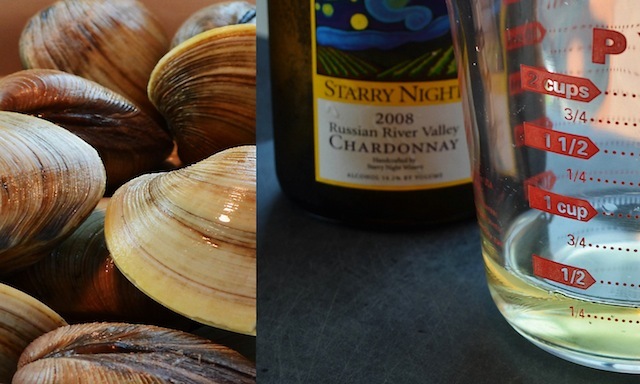 This is just the beginning, however, as the clams—the dish’s star ingredient, after all—are next up. 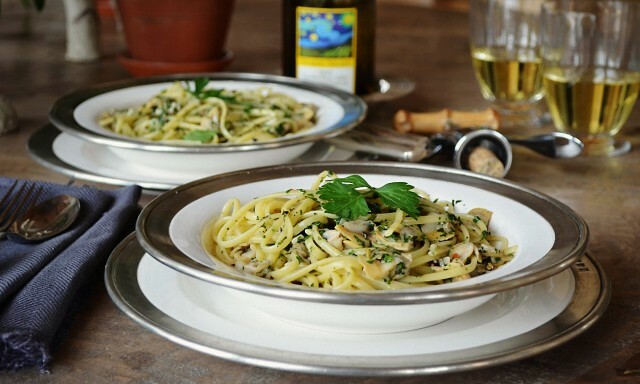 It’s an addition that infuses the sauce with its all-important briny quality, and one that proves the perfect counterpoint to the various other dominant flavors at play here—namely the wine, the garlic, and the parsley. So after thoroughly scrubbing the mollusks in cold water (skip this step and you risk a mouthful of sand and other grit) it’s time to introduce them to the wine mixture. Since the point here is to steam the clams, once they’ve been added to the pot you’ll want to keep them covered, checking every few minutes for any that have opened, and removing these to a separate dish (it can take as long as six minutes for all of the clams to open; if any don’t by that point, throw them away—they’re no good.) 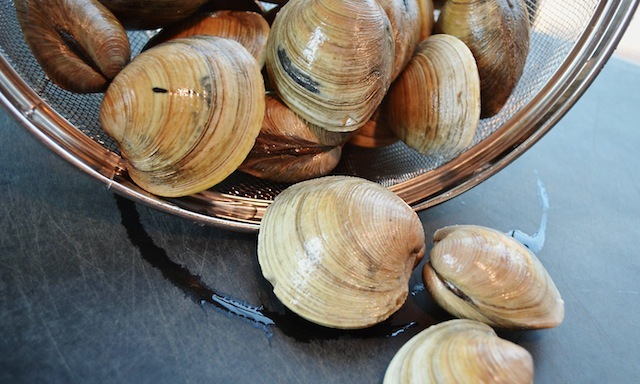 Once all the clams are steamed, set the broth aside and remove the mollusks from their shells, cutting the meat in half or even fourths if they’re very large. 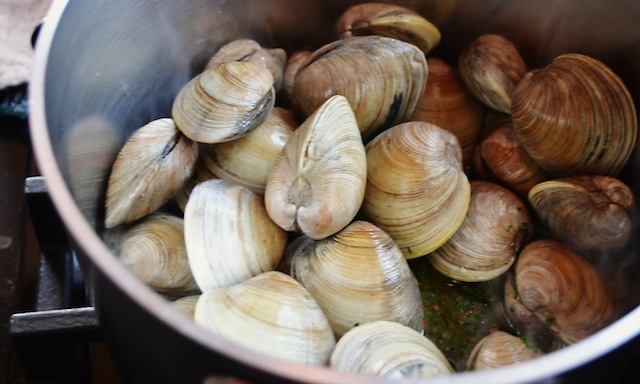 The sliced clams can then be returned to the broth (along with any juices that may have accumulated on your cutting board—this is good stuff! ), and the shells discarded. Two more simple steps to go: the first is to add your pasta (I prefer linguine but angel hair will also work) to a large pot of salted water, then letting it cook to the point where it’s tender but still offers a little give when you bite into it. For the linguine this can take anywhere between six and nine minutes, though it’s much shorter for angel hair. Either way, be sure not to overcook, as the noodles will be exposed to some additional cooking in the final moments of preparation, and you’ll want the final product to retain some of its firmness (otherwise known as “al dente,” a quality whose importance can’t be overstressed). Once done, be sure to hold on to a ¼ cup of the pasta broth before draining—you may not need this (I didn’t) but if the final mixture of pasta and clam sauce seems too dry for your taste, you can always use a little of this to loosen things up. The other step, and this can be started while the pasta is underway, involves first heating the remaining olive oil in a large (ten- or twelve-inch) skillet, then sautéing the rest of the garlic and chopped parsley for a minute or so, or until the garlic is just soft. Set this mixture aside until the pasta is ready, at which point the noodles, along with the clam mixture, can be added to the garlic/parsley combo. Toss all this over low heat for a minute or so (that final cooking stage I mentioned earlier), add a little salt and pepper as needed, throw in a bit of that reserved pasta water if you think it’s called for, and you’re good to go. It’s a concentrated shot of summer during these waning warm months, not to mention an effective reminder of their laid back attitude when the cold weather sets in. —Scrub the clams under cold water and set aside. In a heavy 3-qt saucepan, heat 3 tbs of the oil over medium heat. Add the pepper flakes and cook briefly to infuse the oil, about 20 seconds. Immediately add the wine, 2 tbs of the chopped parsley, and half of the minced garlic. Cook for 20 seconds and add the clams. —Cover and cook over medium-high heat, checking every 2 minutes and removing each clam as it opens. It will take 5 to 6 minutes total for all the clams to open. 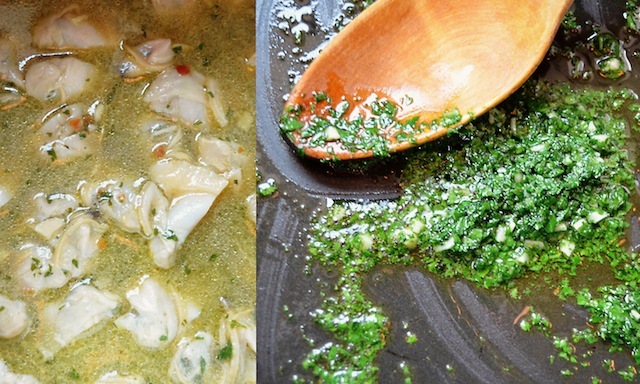 Transfer the clams to a cutting board and reserve the broth. 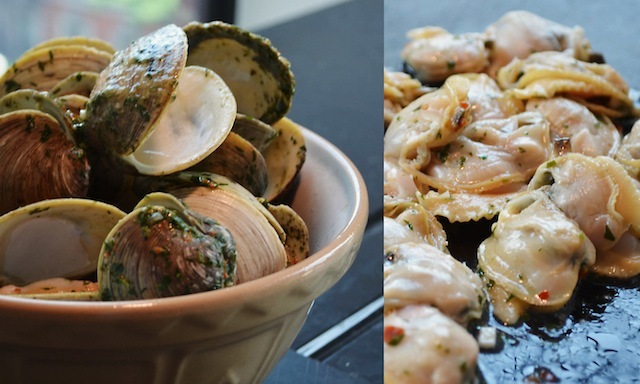 Remove the clams from the shells and cut them in half, or quarters if they’re large. Return the clams to the broth. Discard the shells. —Bring a large pot of well-salted water to a boil over high heat. Add the pasta and cook until it’s almost al dente, 6 to 9 minutes. Don’t overcook. —While the pasta is cooking, heat the remaining 3 tbs olive oil in a 10- or 12-inch skillet over medium heat. Add the remaining 3 tbs chopped parsley and the rest of the garlic and cook until the garlic is just soft, about 1 minute. Set the skillet aside. 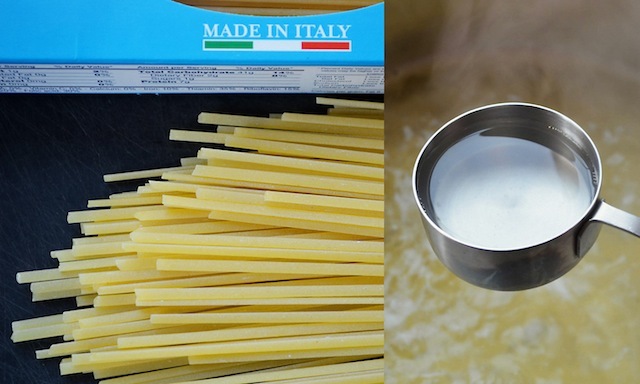 —When the pasta is done, reserve about ¼ cup of the pasta cooking water and then drain the pasta. Add the pasta, the clams, and the broth the clams were cooked in to the skillet. Return to low heat, toss the pasta in the sauce, and simmer for another minute to finish cooking it, adding a little of the pasta water if you prefer a wetter dish. 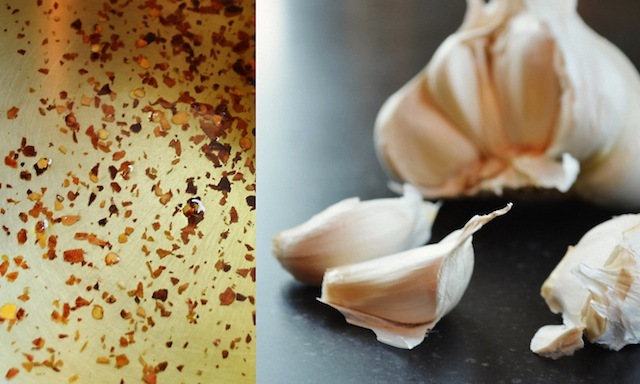 —Taste for salt and add a large grind of black pepper. 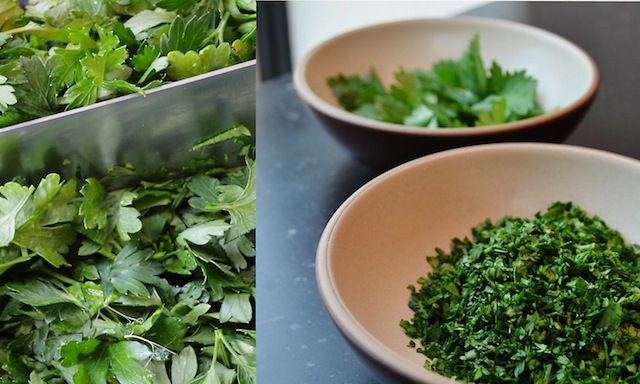 Serve immediately, garnished with the parsley leaves.